(Nanowerk Spotlight) Breath analysis has been recognized as an increasingly accurate diagnostic method to link specific gaseous components in human breath to medical conditions and exposure to chemical compounds. Sampling breath is also much less invasive than testing blood, can be done very quickly, and creates as good as no biohazard waste. We have written about emerging nanotechnology applications in breath analysis in previous Nanowerk Spotlights (see for instance "Nanotechnology breath analyzer for kidney failure"). A recent review article in Environmental Science & Technology focuses on breath analysis as a tool for assessing environmental exposure and provides a good overview of the current state of diagnostic tools, leading studies in this field, and emerging technologies for hand-held breath analyzers ("The Possibilities Will Take Your Breath Away: Breath Analysis for Assessing Environmental Exposure"). The authors set the stage with the basic observation that breath is a medium through which doses of hundreds of chemicals compounds from environmental and occupational exposures, as well as clinical conditions, can be quantified. "Breathe in: it happens every few seconds. Protective barriers are bypassed, allowing your external environment to exchange with your internal environment at the blood-air barrier within the alveoli of the lungs. Exogenous compounds from recent environmental exposures diffuse into your blood, allowing them to contact virtually every tissue in your body. "Breathe out: endogenous compounds reflecting internal bodily conditions diffuse from the blood into the breath. Alveolar air contains important information regarding compounds within your body. Data show that chemicals of concern, including benzene, toluene, and disinfection by-products, are found in the people's breath. 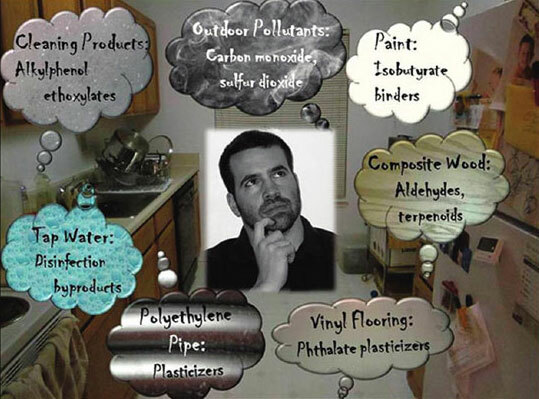 As indoor air pollution becomes a prevalent concern, the fears about unhealthy exposures can be disconcerting." After describing the basics of breath analysis as a diagnostic tool, the authors discuss emerging chemical sensor technology ('electronic noses'), in particular two nanotechnology-based approaches, that are suitable to identify target analytes in breath. One is the use of semiconducting carbon nanotubes, coated with different sequences of single-stranded DNA respond to the chemical identity of odorants based on changes in measured transconductance. The instrument is capable of differentiating among different aldehydes, including octanal, nonanal, and decanal, all of which are commonly found in breath ("DNA-Coated Nanosensors for Breath Analysis"). The other one makes use of coated gold nanoparticles to detect ppb concentrations of compounds in breath from healthy subjects and lung cancer patients. Of the 42 total VOCs identified in this study, nine were found solely in lung cancer patients. We have reported on this work in a previous Nanowerk Spotlight article ("Nanotechnology sensor can 'smell' lung cancer in exhaled breath"). The gold nanoparticle sensor eliminated the need for dehumidification and preconcentration of samples and is inexpensive and portable. The authors emphasize the need for portable, easy-to-use screening systems to facilitate breath analysis in physicians' offices or in the field operation. In contrast, today's techniques rely on instrumentation that requires substantial time and significant skill to utilize and instrumentation tends to be large, table-top based with high power consumption, and somewhat on the expensive side. An increasingly important area where environmental exposure analysis will play a role is indoors – in our homes, schools, public buildings and workplaces. People in the industrialized world now spend roughly 90% of their time indoors every day ("The National Human Activity Pattern Survey (NHAPS): a resource for assessing exposure to environmental pollutants"). Monitoring of breath presents the needed solution for identifying and quantifying the risk associated with exposure to environmental contaminants indoors. As the authors write, "no matter the origin of contaminants or changes they undergo in the environment, their assimilation into the body can be assessed by measuring them in the breath of affected individuals. The breath presents a composite of all doses, providing information about exogenous compounds absorbed from the surroundings, as well as changes in endogenous compounds which may result from such exposures." Achieving such goals will allow for the advancement of breath analysis as a means of quantifying environmental exposures and doses, as well as useful data which can eventually be used to limit individuals' exposure to harmful contaminants.